Your complex, high-production turning application challenge may have a simple solution. The flexibility of Bardons & Oliver’s 4-axis center-drive lathes allow you to manually load or robot load. The design of the center-drive spindle has a very short overall length and integrated workholding to permit simultaneous machining of the front end and back end of the part. The configuration permits very high machining efficiency and allows the critical surfaces at each end of the part to be machined concentric to each other. 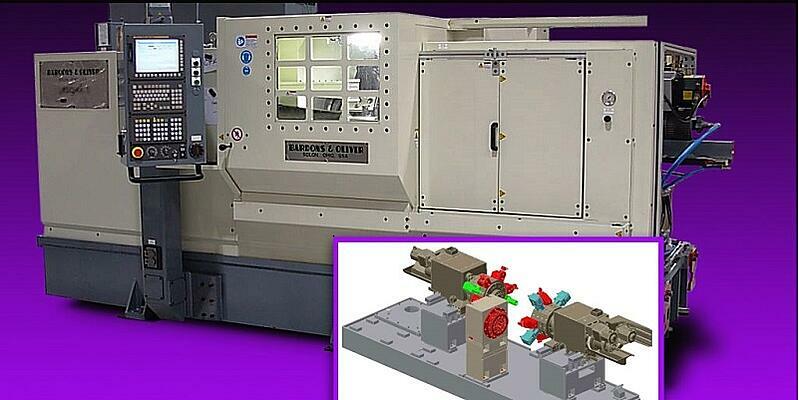 Parts are gripped in the middle while complex machining is performed at both ends. No regripping or relocating allows the highest specifications to be met for dead-true tolerances, held end-to-end. Built with our traditional heavy-duty machine bases and turrets, our 4-axis center-drive lathes carry Bardons & Oliver’s unmatched commitment to quality, precision and durability. Bardons & Oliver has been building custom engineered systems for more than a century. Our employee-owners find custom engineered solutions to your most complex applications.